Dark matter, the mysterious substance estimated to make up approximately more than one-quarter of the mass of the universe, is crucial to the formation of galaxies, stars and even life but has so far eluded direct observation. At a recent UCLA symposium attended by 190 scientists from around the world, physicists presented several analyses that participants interpreted to imply the existence of a dark matter particle. The likely mass would be approximately 30 billion electron-volts, said the symposium's organizer, David Cline, a professor of physics in the UCLA College of Letters and Science and one of the world's experts on dark matter. The physicists at the Feb. 26–28 event were in agreement that "there seems to be an excess in the available data that could be due to dark matter," Cline said. "At this symposium, it was obvious that excitement is building in the fields of dark matter theory and, especially, detection," said Cline, who noted that there are several ways dark matter can be observed and that all were discussed at the UCLA meeting. "Because dark matter makes up the bulk of the mass of galaxies and is fundamental in the formation of galaxies and stars, it is essential to the origin of life in the universe and on Earth," Cline said. The first evidence for dark matter was discovered in 1933 using the Mt. Wilson telescope outside of Los Angeles. More recently, various theoretical models and detector improvements have made it possible to search for dark matter particles at extremely sensitive levels — some of the most sensitive measurements made by any scientists in the world. One search technique involves using the vast amount of dark matter in our galaxy. 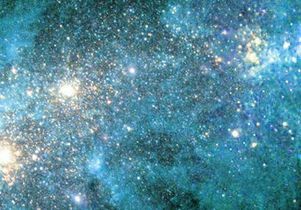 The NASA Fermi Satellite Telescope, an international collaboration involving NASA, the Goddard Space Flight Center and the SLAC National Accelerator Laboratory, searches for gamma rays — very high-energy light particles — from this dark matter. There are models of dark matter that would allow a signal in the galactic dark matter consistent with the claims at the meeting and provide a small interaction consistent with the "null results" in the direct dark matter searches all over the world. Much larger direct dark matter detectors are being planned in the U.S., Italy, Canada and China (including Xenon 3 Ton, LUX-ZEPLIN 7 Ton and DarkSide, which will weigh five tons). These larger detectors potentially could see a dark matter signal in the next few years, Cline said. Dark matter is widely thought to be a kind of massive elementary particle that interacts weakly with ordinary matter. Physicists refer to these particles as WIMPS, for weakly interacting massive particles, and think they originated from the Big Bang. WIMPs are thought to be streaming constantly through the solar system and the Earth. Another search method is to look for an interaction of a WIMP with xenon or argon nuclei and others (like germanium) in very low-background laboratories deep underground in Italy, the U.S., Canada, China and other countries. While these experiments have seen no signal of a WIMP above 30 billion electron volts, "there is no incompatibility with the interesting excess in the FERMI data," Cline said. The discovery of the Higgs boson, which won the 2013 Nobel Prize in physics, plays a role in the search for dark matter, Cline said, adding that this topic was discussed in detail at the meeting. Dark matter, he said, could consist of axions, WIMPs or sterile neutrinos, all of which were discussed at the symposium. The UCLA dark matter symposium is convened every two years; this was the 11th　such meeting. Cline said he and his colleagues hope to clarify the dark matter puzzle at the 2016 symposium. See more on last week's conference. It was at this same dark matter symposium in 1998 that two groups of scientists reported that the universe is accelerating, as well as expanding, a finding Cline described as "one of the greatest discoveries in the history of science."